Whether you are using this Coffee-Milk Thermometer as part of your catering business or for home use, it is easy to use and assists you to make the perfect hot drink with its colour coded recommended temperatures. 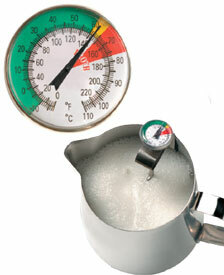 The Coffee–Milk Thermometer comes with a stainless steel clip which mounts the preparation jug. Good service - easy to order, arrived on time and packaged well. The best one I've had and not the most expensive either. The dial is very clear and the thermometer is accurate. Great service from Thermometers Direct too.